The Shuttle Bike Kit converts your regular bicycle into a water-bike / pedal boat. For cyclists who don’t want to stop at the water’s edge, a new solution is now available. It’s called the Shuttle Bike, and it’s quite the add-on to your normal road or mountain bike. 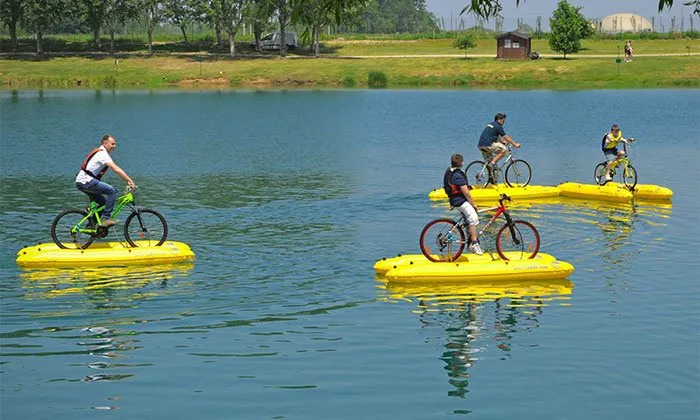 It is basically a portable assembly kit that converts your regular bicycle into a water-bike / pedal boat letting you cross rivers and lakes. It is manufactured by SBK Engineering Srl in Vigevano (PV), originally designed by Roberto Siviero. The Shuttle Bike Kit, with all its parts, comes in a small backpack. Once you arrive at your waterfront destination, you assemble the frame, attach the rudder and inflate the yellow floating pontoons / floats. You inflate the floats with a special bicycle pedal powered pump. You don’t require any tools for the assembly, and the whole process takes under 10 minutes. Once assembled, you are ready to float your way onto the water with a top speed of 10 km/h. The rear tire of the bike drives a roller, which drives a prop under the bike’s front wheel via a flex shaft. You can use all of your bike’s gears. The pontoons are made of special calendered plastic fabric with an intermediate layer of nylon that gives high impact resistance and great rigidity. The floats are not glued but are electro-welded with high-frequency technology to give high seal guarantee. The float also has a double security chamber. The valves are equipped with double cap and quick deflation. The structure of the kit is built with interlocking pipes in AISI 316 steel for greater stability and shock absorption in the event of impacts and anomalous waves. The fixed clamps are made of aluminum and treated in anodic to ensure corrosion resistance in seawater. These bindings will be placed on the frame of your bicycle without compromising the classic use. Three series of shims (semi-bushes) are supplied with different diameters that allow the correct adaptation to the different sizes of the tubes of the bicycle frame. The rudder is hooked to the base of the front wheel allowing great maneuverability and precision of movement. A special tilting joint allows the rudder to get up to ensure re-entry to the shore or overcoming obstacles in the water without damaging anything. Gears transfer the circular motion of the rear wheel through a roller placed in its grip. This system allows you to change the gears of your bicycle so you can increase your pedaling speed. This is the conjunction between the body roller and the propulsion unit. Made of steel cables, it is housed in a lubricated sheath. The Shuttle Bike Kit costs around 1,299 Euros. The best part is that it’s portable. So you could bike from your home to the beach and then use the same bike to have some fun on the water. Would you take it on your next cycling, watercraft adventure? Tienen tienda o local en Miami ? Where can you get this ..or order it…& how much does it cost in American dollars ??? Where can I purchase this in US?